A newly published ghostly image from space as been dubbed the ‘Mouth of the Beast’ by astronomers working with Europe’s Very Large Telescope. 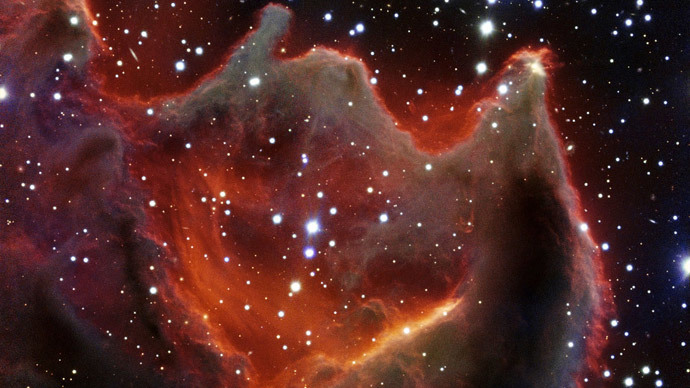 The exact nature of the cloud of gas and dust is a mystery, and has been called a ‘cometary globule’. The strange phenomenon is about 1,300 light-years from Earth in the constellation Puppis, which is also known as the Poop Deck or Stern. Cometary globule CG4 has nothing to do with comets – it’s actually a faint nebula, despite its bright and vivid colors as seen in thephotopublished () by the European Southern Observatory Wednesday. The image depicts the head of CG4 which has a diameter of 1.5 light-years, lit by neighboring stars. The globule has an eight light-year long tail, which is not visible in the image. The “Mouth of the beast” is a small cloud by astronomical standards and is hard for amateur astronomers to spot. The nearby stars’ radiation is gradually destroying the monstrous head of the globule, which is actively forming new stars. Its dust cloud contains enough gas to make several Sun-sized stars, according to the European astronomers. Cometary globules, all in all, are relatively small in size, isolated clouds of neutral gas and dust within the Milky Way. Discovered in 1976 in pictures of the Gum Nebula taken with the UK Schmidt Telescope in Australia, they were named because of their comet-like appearance. Two theories exist to explain the origins of CG4 and other cometary globules. Some astronomers say their form is an effect of a nearby supernova explosion on spherical nebulae. Others suggest the cometary globules are formed by stellar winds and ionizing radiation from hot massive stars. Scientists anticipate finding out more about the mass, density, temperature, and velocities of the material in the globules by measuring molecular spectral lines with telescopes. ESO is an intergovernmental astronomy organization, supported by 15 European countries. It operates the Very Large Telescope, located in northern Chile, which is the world’s most productive and advanced ground-based astronomical observatory.